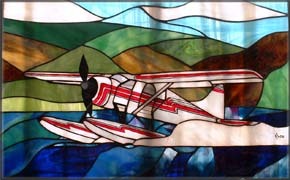 A client approached me about making a stained glass panel for her husband to represent his love of flying and supplied me with a photograph of his Beaver Floatplane. Ever the sucker for punishment, I accepted the commission without first thinking about the design phase. Before I knew it I was struggling with how to capture complex details in a relatively small panel (24" x 15") that could quickly become cluttered. For over a week I pondered the design. 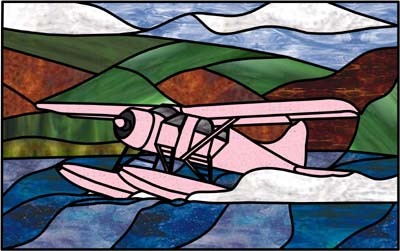 I looked at a variety of other pictures featuring floatplanes, Eastern Ontario cottage country (where the plane "lived") and the motion of water, thinking about how to best convey these in stained glass. It became an obsession which even included some field trips, including one to the Ottawa River to "analyse the water's motion" and another to an aviation museum to look at planes! My biggest challenge was to create an authentic and convincing floatplane while avoiding very tiny pieces of glass that might not line up properly or could be buried in solder. A lucky experiment with copper sheeting last year gave me the answer. It had the advantage of being malleable and could be shaped to provide depth and definition, while copper wire provided the thinner and more distant supports. Copper sheet was also useful in creating the plane's propellers with the option of being reshaped by the pilot/husband with his better knowledge of how they should look. Glass paint added the final details. Glass Eye 2000 made this panel — and so many of my other projects — possible from start to finish. Being able to scan in a range of individual images and trace over them allows me to create a composite design. I also use the glass library to experiment with different glass options so that I know what colours and blends I want to use in the project, sometimes even which specific glasses, in the amounts that I will need them, as well as the ideal thickness for the solder lines/lead came for the piece. The export feature allows me to email some reasonable mock-ups of the finished project that even the most uncreative client can appreciate and understand, with a price that is calculated by the software — and confirmed by second calculation that I use. Contact details for the client can be attached to the design, and I can even print out a shopping list of what I need for each project when I go to my suppliers! I began to use Glass Eye 2000 while I was still a hobbyist because it was much easier to use than any other design software, while providing MANY more functions than other "simple" packages. The program has continued to prove its value to me and never fails to impress my clients — especially during design reviews. They suggest changes and I make them right in front of their eyes. Anything that makes me look like a genius has to be a good thing! 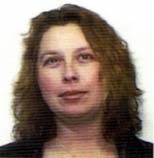 Sara began her passion for stained glass in Belfast, Northern Ireland while looking for a new hobby. A watercolor class was full, but a course on Tiffany glass caught her eye. By the end of the first class, she was completely hooked. After moving back to her native Canada, Sara set up a small studio space in the basement of her home. In November 2004, she launched Jara Glassworks through the HRSDC Self Employment Benefit Program. Her work has been a mixture of the traditional images and themes of Victoriana and the Arts and Crafts Movement married with current trends, contemporary colors and new ideas. Jara Glassworks is a popular exhibitor at many area artisan shows, home shows and other venues.